David Eichelberger was born in Roanoke, Virginia, in the Blue Ridge Mountains. 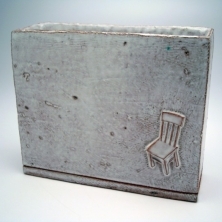 While in college at Virginia Polytechnic Institute and State University, David was introduced to functional ceramics. In-depth study, drawing from a range of instructors and influences, earned him a B.F.A. Degree in 2000. After graduation, David studied at the Penland School of Craft in western North Carolina. This period of his education helped solidify David’s aesthetic interests, and eventually led him to move to Santa Fe, New Mexico. David worked at Santa Fe Clay Company, a ceramic gallery and retail store, as well as in the on-site studio, teaching classes. He was in New Mexico for almost three years when he was granted residency at The EnergyXchange, in Burnsville, North Carolina. The residency facilities, including David’s kiln, were fueled by reclaimed landfill gas in an effort to provide cheap energy while protecting the environment. David completed his three-year term at The EnergyXchange, and returned to school, earning his M.F.A. from the University of Nebraska-Lincoln, in 2010. David was an invited artist at the Australian National University in Canberra, during the month of August, 2010, and spent a year as an Artist In Residence at the Appalachian Center for Craft in Smithville, Tennessee. Currently, David is halfway through a three year term as a Resident Artist at the Penland School of Craft in Penland, North Carolina. David makes ceramic objects with a functional sentiment and a sculptural approach to form, and his work has been shown extensively throughout the states. Functional qualities, visual rhythms, and exaggerated proportions are some of the elements I compose in my work to create pause. The objects I make are both an anthropological study and an artistic endeavor, and incorporate an attempt to understand the world we live in, through making. The intentional placement of openings, lids, and handles in my work conveys the specificity of function, clarifying that the objects I make propose an intended purpose. The exact function may be less obvious, and a situation is created that pairs a sense of knowing with a sense of mystery. My work exhibits a compositional preference for repetition over variety, and I position repeated elements in regular, metered fashion. A rhythm develops, with a cadence that promotes a rambling exploration of the forms. Vessels for containment are the products of a desire for order, a universal human engagement. Interiors are made special by manipulating access to them, rarefying the space my vessels contain. Simply reaching the interior, literally or visually, is an event, a private ritual that is a self-justifying endeavor. The composed nature of my work reflects the quiet sentiment of my investigations. My endeavor is a disciplined approach, aimed to augment one's engagement with their surroundings by creating objects in a thoughtful manner.